Every A&O location offers various categories in different price segments. You can 'design' your stay making completely individual choices. The single, double, and family rooms feature a hair dryer, soap and shampoo as well as bedclothes and towels. All rooms have a table with a chair, a storage space and a mirror. The multi-bed rooms have a locker, hair dryer as well as soap and shampoo. Bedclothes and towel can be rented at the reception for a small fee. A towel has a one-time cost of 1.50 euro and the bedclothes 3,50 euros. You are also welcome to bring your own bedclothes and towel. Almost all A&O locations have private parking spots or an underground parking lot. Please have a look at the individual location descriptions. The parking spots cost from 5,00 € per day. If you would like to reserve a parking spot, please include this in your booking. 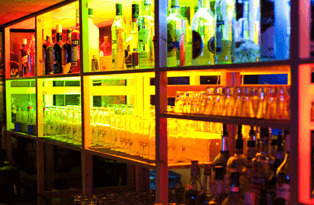 Each A&O Hostel offers you the opportunity to enjoy your evening in a fun and friendly setting at the bar with a cocktail or beer. In some locations you can relax on the rooftop terrace with integrated bar and take in the breath-taking panorama views of the city. To get a little preview you're welcome to have a look at the bar menu. The large, welcoming lobby with the reception, the children's corner as well as Internet terminals is the first place to go and find information about the city or the location during the entirety of your stay. In addition to the numerous brochures about the most varied sights and shows, we also offer you the possibility to buy tickets simply and directly through us. Our friendly reception staff is available to you 24 hours a day and can help you with any concern. All of our locations that are suitable for group trips have an A&O Lounge that invites guests to relax or to use for quiet work. 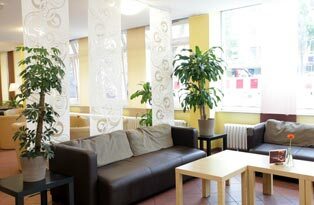 The A&O Lounge is equipped with a computer, printer, telephone and fax (local calls are free), free Internet access, a kettle, as well as a comfortable place to sit and is free to all group leaders. The A&O München Hauptbahnhof, A&O Köln Dom und A&O Hamburg Hammer Kirche locations do not have an A&O Lounge. Almost every A&O Hostel has common rooms with integrated game modules such as billiards, table football or a TV room with comfortable seating that invite guests to relax and have fun. 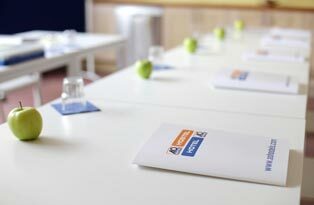 Are you interested in a state-of-the-art, yet inexpensive conference room? Here you can find more information.